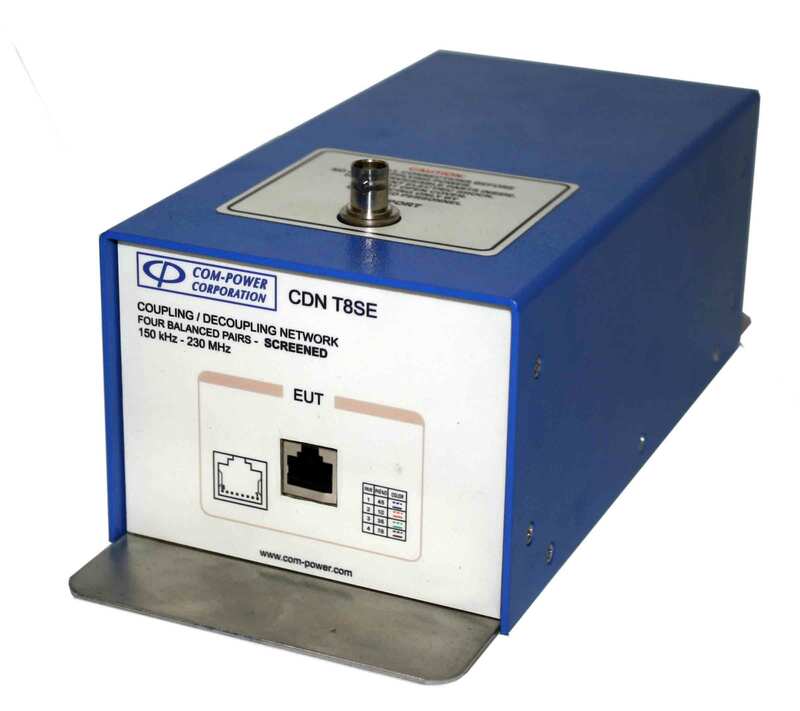 The Com-Power CDN-T8SE is used during conducted emissions or immunity tests on devices with signal/telecom ports intended for connection to shielded (or screened) lines with up to four balanced pairs. The EUT and AE ports of the CDN-T8SE are equipped with shielded RJ45 receptacles. The RF input/output port is located on the top side of the network, and is fitted with a female BNC- type connector. The outer surface of the network?s metallic enclosure is powder coated for durability, and is mounted onto an untreated (conductive), stainless steel base plate. The base plate extends beyond the footprint of the network enclosure at the front and back, providing convenient access to effectively ground the network, which is essential. Any individual Com-Power CDN may be purchased separately, or as part of a CIS series conducted immunity test system. Test systems also include an ACS series power amplifier, as well as the required accessories.